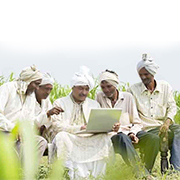 Prime Minister Narendra Modi sowed the seeds for a farming revolution, with the launch of eNAM, an online portal for trading in agriculture produce, which promises to liberate farmers from the clutches of middle-men and realise fair market value for their yields. The e-NAM marketplace will initially enable farmers in eight States - Uttar Pradesh, Madhya Pradesh, Jharkhand, Himachal Pradesh, Gujarat, Telangana, Rajasthan and Haryana - to sell 25 commodities in 21 wholesale mandis. The commodities that will initially be sold online include chana (black gram), castor seed, paddy, wheat, maize, turmeric, onion, mustard, mahua flower, tamarind and shelling pea.